But at least it translates onto nails! This was done using my MASH brushes, Planks a Lot (OPI), Grape Pop (China Glaze), Happy Go Lucky (China Glaze), and Sand Tropez (Essie). Not much else to say about it. Hey! 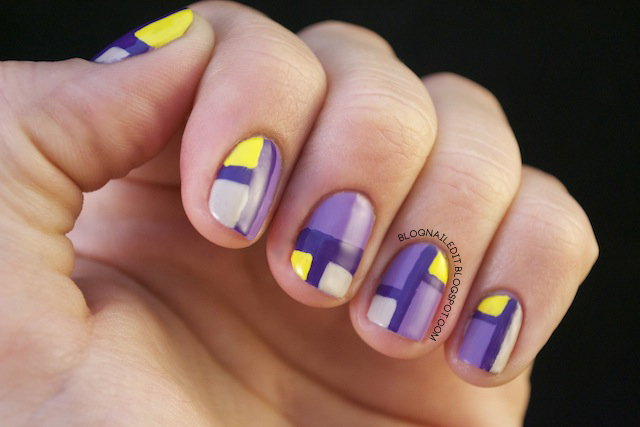 I just started following your blog, and I'm loving all the beautiful nail designs! And more importantly (to me at least) is that most of them are things that I can try to recreate at home, which makes me way more pumped to try them all out! Question (and you may have answered this already, but I didn't read ALL the archives...) my nails chip once they get longer, no matter how careful I am. Do you have any tips for keeping the length? Or am I doomed to always have 1 or 2 stubby nails? Unfortunately I don't think I'm the best one to answer this question. I have the same issue of breaking my nails once they get to a certain length (which isn't very long at all). I was really bothered by that for a long time, but have learned there's not much I can do about it. Some girls are born with naturally thick, strong nails, whereas some of us have some brittle little guys. The best thing is to learn which length works best for both your hands and your lifestyle. The only way to keep them from chipping is to be careful with them. Don't use them as tools and keep them away from your mouth. Polish certainly helps by adding an extra layer of thickness to your nails, but that can only do so much. Ultimately, applying polish may not be helping the problem, but there's only so much you can do to increase the health of your nails. Taking some Biotin or prenatal vitamins has been recommended by women as well. That certainly wouldn't hurt the problem, and would also add some extra bonuses to your health. The best advice I have is to watch how you use them. They're not built to be tools anymore, and can only withstand so much abuse before they'll bend and break. Keep them clean, don't pick at them, and take good general care of them. They'll only grow to be so long for you until they reach their breaking point, and that's OK. Just as people are different, so too are their nails. So cute! I love that bright yellow!